City in Asia Minor, on the Yeshil-Irmak (the ancient Iris). The population in 1900 was 23,000. The city is now of little importance; but, to judge from the number of Spanish fugitives that sought shelter there, it must have been prosperous during the sixteenth century. A tragedy of interest to Judaism occurred in the sixteenth century within its precincts. A Christian had entered the house of a Jew and had not come out again. A number of Jews were suspected, and, under torture, confessed to his murder and were hanged. 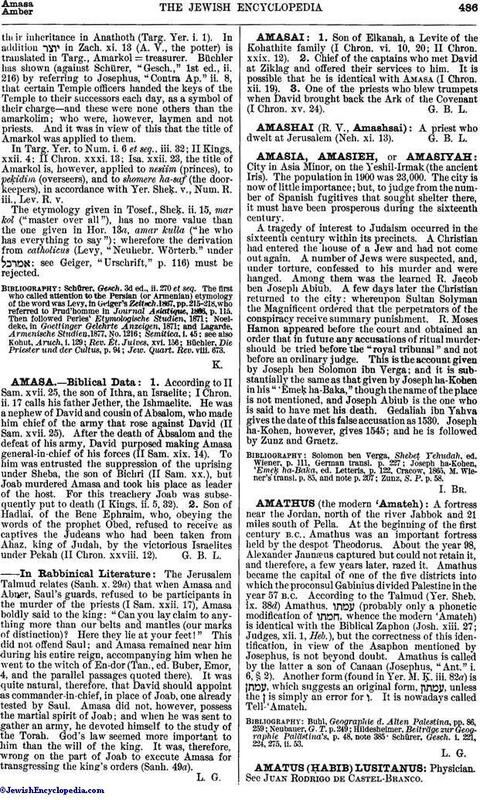 Among them was the learned R. Jacob ben Joseph Abiub. A few days later the Christian returned to the city: whereupon Sultan Solyman the Magnificent ordered that the perpetrators of the conspiracy receive summary punishment. R. Moses Hamon appeared before the court and obtained an order that in future any accusations of ritual murder should be tried before the "royal tribunal" and not before an ordinary judge. This is the account given by Joseph ben Solomon ibn Verga; and it is substantially the same as that given by Joseph ha-Kohen in his "'Emeḳ ha-Baka," though the name of the place is not mentioned, and Joseph Abiub is the one who is said to have met his death. Gedaliah ibn YaḦya gives the date of this false accusation as 1530. Joseph ha-Kohen, however, gives 1545; and he is followed by Zunz and Graetz. Zunz, S. P. p. 58.